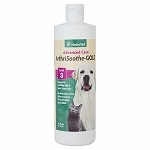 Arthrisoothe Gold Tablets - Joint supplement for dogs and cats with arthritis. This natural pain relief remedy for pets with joint pain and stiffness contains glucosamine, chondroitin, MSM and more. Take 10% off this item. Use promo code "April2019" at checkout. 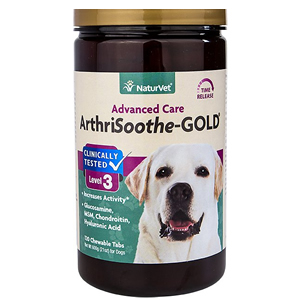 Arthrisoothe Gold is a natural arthritis treatment that helps dogs with joint pain and stiffness. This formula contains extra strength levels of glucosamine, chondroitin, MSM and more for dogs with advanced joint dysfunction. The antioxidants Ester-C (Vitamin C) and Vitamin E help protect against free radicals that cause cellular damage. Support, maintain, and contribute to rebuilding damaged cartilage and tissue. Improve joint mobility and reduce stiffness and pain associated with exercise and arthritis. 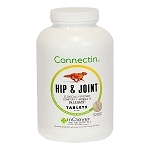 Recommended to support healthy hip and joint function in dogs. Each bottle contains 120 chewable tablets. Also available in 90 ct. tablets, soft chews and liquid. Mr Doodle is a twelve year old pup who has been using this product for about five years. It allows him to have a happy mobile life despite some problems due to a shakey start in life. We are very grateful for the Arthrisoothe! AN EXCELLENT PRODUCT . MY 8 YR, OLD BLACK LAB HAS DEVELOPED ARTHRITIS DUE TO AN INJURY WHEN SHE WAS A YOUNG DOG. SHE COULD HARDLY GET UP FROM A LAYING POSITION ON THE HARDWOOD FLOORS. AFTER ABOUT 6 WEEKS SHE IS MOVING ALMOST LIKE A YOUNG GIRL AGAIN. My 10 year old Yellow Lab started having trouble standing and getting into the car. She would hold her legs up, one at the time, while eating. After lots of medical test and x-rays, there was little evidence of arthritis and water on the knee, I decided to place Gracie on Stage 3 of NaturVet's ArthriSoothe-Gold. She had been on NaturVet's Glucosamine DS with Chondroitin, Stage 1, for a couple of years, but that wasn't helping much. But going on the Stage 3 ArthriSoothe-Gold seems to have been a miracle. My wonderful Gracie is back to walking normal, running and hopping into the car in just 4 to 5 weeks. What a happy mama I am. 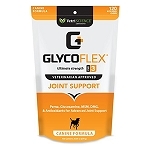 Glucosamine stimulates the secretion of glycosaminoglycans (GAGs), one of the building blocks of cartilage and the synovial fluid found in joints. GAGs increase the lubrication of the joints and provide flexibility and elasticity to the cartilage. The sulfur in MSM can be utilized by the body in the formation of compounds such as glucosamine and chondroitin sulfate, as well as the amino acids methionine and cysteine. Arthritic joints often have low levels of both sulfur and cysteine. Animal studies have found MSM helps to strengthen the tissues that make up the joints. Chondroitin is produced in the body and it works to prevent enzymes from degrading the building blocks of joint cartilage. Chondroitin sulfate is often used in combination with glucosamine, however, when used alone, glucosamine sulfate helps the body to manufacture its own chondroitin. Animal studies have demonstrated Boswellia provides a dampening effect on inflammatory processes by inhibiting formation of proinflammatory leukotrienes. May help to alleviate pain associated with daily exercise. Calcium helps to maintain healthy bones, teeth and muscle. Ester-C is a non-acidic, well absorbed form of Vitamin C.
An essential trace mineral that is essential for growth, appetite, wound healing and skin integrity. 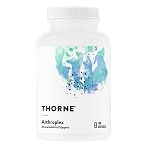 Effectively maintains connective tissue health in crucial areas such as joints, skin andcardiovascular system. Vitamin E supplies oxygen to the blood and helps to maintain healthy membrane tissue. Vitamin E also inhibits the prostaglandins that play a role in pain, thereby reducing joint pain. Dicalcium Phosphate, Gelatin, Magnesium Stearate, Maltodextrins, Microcrystalline Cellulose, Natural Flavoring (from chicken liver), Non-Fat Dry Milk, Rice Powder, Silica Aerogel, Stearic Acid and Whey. After the initial three week period the number of tablets can often be reduced to a level that maintains the pet. Reduction should be done gradually in 1/2 to 1 tablet increments depending on the size of the pet, and should not be reduced more then one time per month. Administration may be increased at any time depending on the pet's needs. Thorne Research Arthroplex - Joint Support for Dogs & Cats - 180 ct.